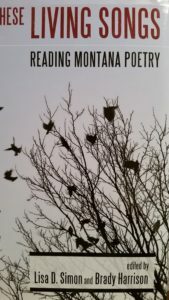 Danell contributed two essays to this exciting anthology–the first dedicated solely to Montana poetry. “Tell me what you think of these poems, she says, handing me a brown book. I glance at the cover: Food of Gods and Starvelings: The Selected Poems of Grace Stone Coates. Who, I wonder, is Grace Stone Coates? I find her name irresistible—ringing, as it does, of a gentleman’s jacket, the cargo that dragged Virginia Woolf to the bottom of a Sussex river, and some unbidden, undeserved gift from God. Surely this is the name of poet. On we jolted, over the dusty, primitive road, around and over hills, some sage-brushy, some dressed in drought-bedraggled wheat, some left to the jack rabbit and the sere remains of old crops…and, of course, the train from the east was late—hours late….then boredom and heat in the station until the Pullmans and day coaches rolled in, with more hours to go while we followed the cottonwood-lined Musselshell through Lavina, Ryegate and Harlowton to the whistle stop at Martinsdale” (Rostad 37). Martinsdale –not even substantial enough to command a place in the regular train schedule. A mere whistle stop. What universe could possibly unfold itself there? I examine the cover of the book. It bears the browns of earth: dirt, sand, mud—the coat of a mink, an ermine, an otter. The color of bark and stones. Before I’ve read a word of poetry, the portrait of Coates on the cover harmonizes with a vision I am beginning to create in my mind. She is a sepia goddess of the Gibson Girl variety: skin as pale and perfect as fresh milk; light hair billowing in waves under ribbon and bow. A decorous high collar, a modest slice of lace just past her throat followed by a rapid tide of ruffles from shoulder to shoulder. There is only one thing I don’t understand: why is every inch of ruffle and lace black? Even down to the flowered ribbons in her hair. These aren’t mourning clothes. I’m baffled, curious. Early 20th-century portraits almost always depict young women in modest, demurring, sinless white. Yet here is Grace Stone Coates, dressed all in black. At first, Tami Haaland’s poems appear to be quiet meditations on ordinary life in the American West. Dirty dishes, messy offices, and frustratingly long waits at railroad crossings all become poetic material in the hands of this Montana Poet Laureate. Even her language is unpretentious, no more demanding than the daily newspaper. But all this apparent docility is merely camouflage. In each of her two collections of poetry, Breath in Every Room and When We Wake in the Night, Haaland draws us close to our trifling world to reveal the profound questions of human existence which reside there. Some of these questions have to do with nature of our mortal coil, so mysterious, so full of possibilities, but at the same time so vulnerable. Others long to understand how we make sense of our world and how we use language to describe, preserve, and transform our lives. On the surface, for example, “Goldeye, Vole” appears to be simply a poignant description of the Montana prairie. But, as we read closer, we realize how far into the essence of our human condition Haaland is probing. white quartz and bone. (Breath 66). Here, the prairie possesses a language more exquisite than the frail grammar of human phrases. Its beauty is not the sublime summits of granite peaks, but the loveliness of things found on the ground: animal tracks, sage brush, animal bones, and rocks. Its vocabulary is not spoken in words, but lived in the body. One learns it by moving through the land. The body knows the feel of “buffalo grass” and “puff ball” (66) along the legs. It recognizes “blue lichen, gayfeather,/goldeye, vole” (66) in their purest sense, before words like “perspective,” “travesty,” or “the permanence of loss” enter with their inevitable desire to fix or judge or mourn. The poet longs to reclaim this perfect language and urges the prairie muse to share her song. The poet, poor artificer of words, aches for the magical melody she can never reproduce. Her own song, bound by the limits of human language, recognizes that it cannot match the “language of dry wind” (66), but still it reverberates with love, wonder, and yearning for the beauty beyond its grasp.